Gripping story of a man who is not able to form new memories. Christopher Nolan's brilliant storytelling device lets the audience experience the events of the film as the main character would. The acting, directing, and writing are excellent. The story is about a man who has no long term memory tries to piece together his life and finds things are not as they seem. This movie has really clever writing and great acting. Complex in its simplicity, Memento is one of the most tense, intriguing, and involving thrillers ever made. The film features an amazing screenplay bolstered by some fantastic editing choices. A masterpiece from genius Christopher Nolan. One of my all-time favorite films, and one of the best films of the 2000s. 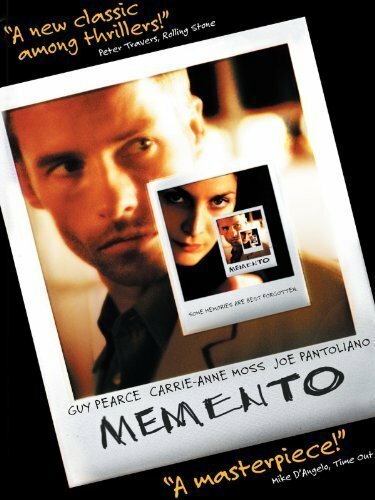 Easily the most complicated movie I've ever seen, with its outstanding structure, acting, direction and overall story, Memento is a modern mystery classic, with a slight trail of neo-noir. Leonard Shelby is from San Francisco. He has a motel room. He has a car. He has a murdered wife. What he doesn't have is his memory. And still, armed with basically next to nothing, he sets out to find his wife's killer. Christopher Nolan made the right choice choosing Guy Pearce to embody Leonard Shelby, because he is a perfect fit. I can see he is tormented, confused, determined and vengeful, visualizing some of the most well-developed and directed characters put to screen. No posts have been made on this movie yet. Be the first to start talking about Memento!